New York City Football Club today completed the world’s first football signing of 2018. At 5:00 a.m. ET on Sunday morning, as the clock simultaneously struck midnight for January 1, 2018 for the first time on the planet in Samoa and Christmas Island/Kiribati (UTC+14), NYCFC announced that Paraguayan international Jesus Medina has joined the Club. Subject to receipt of his P1 Visa and ITC, the 20-year old becomes City’s third Designated Player and NYCFC’s first-ever “Young Designated Player”. 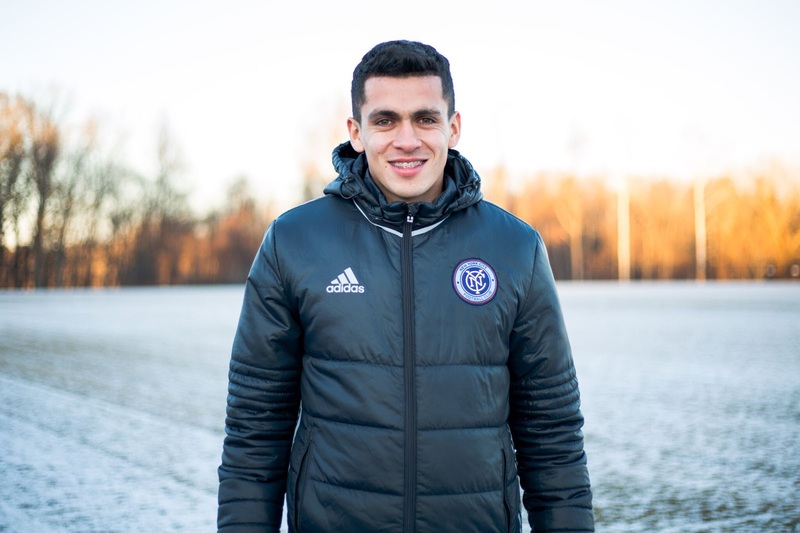 Medina is an attacking midfielder who can play wide or as a no.10, and he has signed a four-year contract with NYCFC, following his transfer from Club Libertad in his native Paraguay. Medina told NYCFC.com, “It’s a unique feeling, I’ve always wanted to play at a grand club like New York City FC who are doing great things and it’s a privilege to be here. “My first thought when I heard of the interest was that it was a great club, an important club in the United States - it’s a great feeling. Claudio Reyna talked to me and said wonderful things about the club and the league. I then made the decision to go over there to keep growing as a player and as a person. Jesus joins NYCFC from Club Libertad, the Asuncion-based team he debuted for at the age of 15. He’s since gone on to make 74 senior appearances, scoring 17 goals and playing 14 times in South American continental competition, helping Libertad to the semifinals of the Copa Sudamericana in 2017. A five-time Paraguayan champion, Jesus brings a winning mentality to New York City where he’ll link up with fellow 2018 newcomers Saad Abdul-Salaam, Brad Stuver and Anton Tinnerholm. NYCFC Head Coach Patrick Vieira describes Medina as a “special talent” who can weigh in with goals and assists for his new team, despite his youth. Vieira said in a statement, “We are really delighted that we have managed to bring Jesus to the football club because we believe that he’s a special talent. We don’t look at the age when we identify the players we want to bring to this football club, we just look at talent. “Obviously any young player will need time to adapt and there will be some parts of his game that he will need to develop but I believe that we have the structure in place at NYCFC to help him do that - we will make him feel like he is at home. Medina’s promising start to his career has garnered recognition through Paraguay’s international age-groups. He first came to the attention of national team selectors in 2013 when he represented the U-17s for the first time, scoring seven goals in 15 appearances before advancing to the U-20s at the tender age of 17. At that level, Medina featured in two Copa Sudamericano U-20 tournaments, captaining the side in the the 2017 edition where he played four times and scored two goals. Sporting Director Claudio Reyna believes NYCFC have added a player with all the personal and playing attributes to develop and succeed in his new surroundings, and said, “Jesus is a talented attacking player who can play as a winger or number 10 and will fit really well into our system and style of play. He is a left-footed technical player with a quick turn of pace, who can score and create goals for his teammates. Jesus has many exciting qualities and combined with his work ethic will be a great addition to our club. Jesus made his senior Paraguay debut vs. Mexico in July 2017 and will be hoping this move brings him more opportunities to shine on the international stage. Announced as the clock struck midnight to signal January 1, 2018 in the LINT (UTC +14) Time zone, Medina’s transfer will go down in the history books as 2018’s first in world football.